I have finally taken the first few steps toward a goal I’ve secretly held for most of my adult life, but I’ve never had the nerve to truly commit myself to accomplishing. Thanks to some friends encouraging me and two people in particular leading the way, I have now joined a beginning running group. We are starting off slowly and working our way up to running a 5k in September. As a group we run two times a week and we have a schedule of activities to do on our own as well. My favorite running spot in Buffalo is Hoyt Lake at Delaware park. Here are some Insties I took on my cool down walk after a recent run. 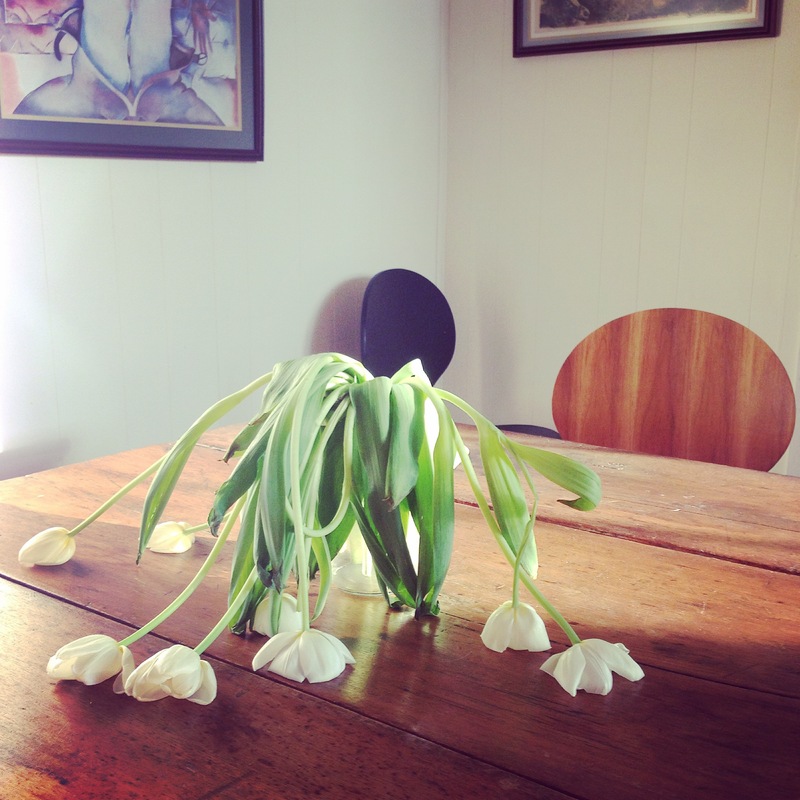 These tulips did such a lovely job of being beautiful for a few days and now they’re all tuckered out! Today I took the Christmas tree down. This is usually one of the first signs than I’m ready to embrace a new year. I’m looking forward to what is to come. On our second day in Prague we were still adjusting to the time change and ended up sleeping in a bit before grabbing a small bite in Siddharta Cafe at the Buddha Bar Hotel (Breakfast is included in the price of a room!). We then set out in search of more adventures, guided in part by the New York Times Article (36 Hours in Prague) that Allen had folded up and tucked in his pack. A requirement for us when traveling is finding good coffee that can be enjoyed in a pleasant atmosphere. We would have been deeply disappointed if the only options were hotel coffee, or Star Bucks. The article recommended Original Coffee close to the church of Jan Hus at Betlemske Namesti. It was a delightful option on a quiet street and the espresso had a perfect caramel colored creme. We warmed to the place immediately and decided to make it a stop every morning for the rest of our stay. On a recent trip to Williamsburg, NY, I managed to take 26 Instagrams, bringing me to a grand total of 500 Instagrams since I joined the social media platform in the Spring of 2012. That may sound like a lot or a little, depending on your perspective. It averages out to less than two a day. I’m a pretty picky curator. I only post the results I’m most pleased with, so in reality, I’ve composed far more shots that never made the cut. I’m sure there are many changes ahead for Instagram. Image archiving and sorting will likely improve with time. Of course there are various third party apps to assist with just that, but I kind of like Instagram’s current method of archiving just the way it is. Users can amass hundreds and hundreds of images over time that are stored very simply by the moment in time when they were created. Whether you use your smart phone to compose an image in real time or you import an existing image and apply an Instagram filter, they are all stored chronologically. It’s like a little time capsule right there in the palm of your hand. I love photography. I own numerous cameras and I use each of them in different ways. For me, smart phone photography is just fun. Since I travel a great deal for my job, it gives me a way to easily document my experiences using a method of capturing the everyday in a way that is itself very connected to the everyday. I’ve already been to Connecticut since I hit the 500 mark, and soon I’ll be traveling to Chicago, Albany and Minneapolis. Imagine all the Instagrams! My Instagram account is set to private, but I post some of my favorite shots on my Tumblr account. Check it out here: http://littleardour.tumblr.com/. In the midst of my regular and usually quite aimless meanderings online, searching for meaning on subjects I obsess over and research in my spare time, I was recently reminded of this talk entitled, This is Water, given by David Foster Wallace in 2005, addressing the graduating class at Kenyon College. DFW committed suicide in 2008 and it is impossible to read or listen to this talk now without thinking of what was to come when he originally delivered it. As I read on, I was so moved, I decided to order the speech which has been reprinted in book form by the Hatchet Book Group. It’s a small and lovely book and I’ve been carrying it around for days. I especially like how DFW eloquently points out that we are not victims of some innate inclination for how we find meaning in our lives, or as he puts it, we are not “hardwired” in some specific way. Instead we are free to choose. It’s so easy to become trapped in the tedium of every day life and think that we are free. It means being conscious and aware enough to choose what you pay attention to and to choose how you construct meaning from experience. There’s so much more to discover… Google This is Water, and see for yourself. From Grant Street in Buffalo to Pearl Street Rd in Corfu, and various points in between, these are some images I’ve made in my travels around the area over the last two weeks. Instagram provides a fun way to interact with new surroundings when you’re on the go. I like the format of Instagram as a social network too, because it acts as a time capsule for collecting a mass of images, in chronological order all in one place. On a recent trip to Toronto, Allen picked up a coffee syphon for my birthday. I can’t say I’ve ever brewed a finer pot at home. I’m pleased to report that in 27 easy steps, you too can enjoy a delicious cup of coffee. Ok, it’s only 6 steps plus clean up, and all for a cup of coffee well worth any labor of love you put into it. Below, check out the photos I took of my first time using the coffee syphon, step by step instructions and video footage. Have a Nice Coffee Time! What kind of coffee do you like? French or American? Strong or Mild? Much or Little? You can have any type using our Coffee Syphon. Modify brewing time and amount / grind / flavor of coffee to suite your taste. Practice makes perfect, you’ll soon be an expert! Below is the 6 step process for making coffee in a coffee syphon.